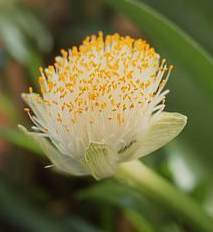 Haemanthus albiflos is a very variable plant growing up to about 250 mm high when in flower. The oblong leaves vary in colour from pale to dark green or greyish-green and are usually smooth and sometimes shiny. They may occasionally be covered with short, soft hairs, or have yellowish spots on the upper surface. The upper half of the bulb is usually exposed above ground and is bright green. H. albiflos has a long flowering period extending from early April to as late as July (autumn and winter) in the wild, but sporadic blooms may also appear at any time of the year under cultivation. The flower head (known as an umbel in botanical terms) is compact, usually about 30-50 mm wide, and consists of numerous erect, narrow white flowers, enclosed by several broad, greenish-white bracts. The erect stamens protrude conspicuously beyond the tips of the flowers and their anthers turn bright yellow or orange when ripe. The ripe fruit is a most attractive bright orange or red fleshy berry producing a distinctive musty odour. Haemanthus is a most interesting, endemic southern Africa genus comprising approximately 22 species, the vast majority of which occur in South Africa, in particular the arid region of central and western Namaqualand. The genus is also represented in central and south-western Namibia and in southern Mozambique, and also occurs in Lesotho and Swaziland. All the species are bulbous geophytes with perennial fleshy roots and produce a dense clusterof red, pink or white flowers. The species from the western parts of southern Africa are all winter-growing with a distinct summer dormant period. Those from the summer rainfall parts are mostly summer-growing and dormant in winter, but there are also three evergreen species in this region, namely H. albiflos, H. deformis and H. pauculifolius. In addition to their eye-catching flowerheads, the leaves of the various species are particularly attractive and interesting: the well known H. sanguineus produces two very broad leathery leaves which lie flat on the ground; H. crispus produces two erect narrow leaves with wavy margins and attractive spots or blotches in the lower parts; and H. pubescens produces two lance-shaped, recurved leaves, densely covered with soft hairs on the upper surface. The most astonishing leaf of all belongs to H. nortieri which produces a single erect, spoon-shaped leaf with a slightly sticky surface to which tiny sand granules adhere. The name Haemanthus is derived from the Greek haima meaning blood, a reference to the red flowers of most species, and anthos meaning flower. Albiflos refers to the white flowers of this particular species. Bees and butterflies visit the flowers and are probably the pollinators, but this has not been confirmed. This plant is reported (Pooley 1998) to be used in traditional medicine to treat chronic coughs and as a charm to ward off lightning. H. albiflos It is an ideal plant for a shady rock garden or for difficult parts of the garden receiving poor light, where they can be left to multiply for many years. It is one of the easiest of all the Haemanthus species to grow. It requires a dappled shade position similar to that preferred by clivias, and likes to remain undisturbed for many years once established. The soil medium must be well aerated. A suggested medium is equal parts of well rotted compost, coarse river sand and loam. Plant the greenish bulbs with the upper half exposed and the thick fleshy roots spread out horizontally over the medium. It also makes an excellent subject for plastic or terracotta containers and these need not be deep as the roots naturally spread out horizontally. Pots of H. albiflos can be grown very successfully on a shady verandah and it is also suitable as an indoor plant where it should be placed in a position receiving dappled light but not direct sunlight. Plants like to become pot-bound and mature bulbs flower reliably every year, and only need to be divided every seven or eight years when flowering performance starts to diminish. H.albiflos is not hardy and has to be grown under the protection of the cool greenhouse in countries with very cold winter conditions. Propagation of H. albiflos is by seed and by separationof offsets from thick clumps. Seeds are sown once the ripe berries have become soft and turned a bright orange or red colour from the end of winter to early summer, depending on the particular form being cultivated. Remove the hard oval-shaped seeds from the berries, wash them in water to remove the sticky pulpy layer surrounding them, and allow to dry for a day or two. Sow the seeds evenly in deep seed trays in a medium of equal parts of finely milled bark or finely sifted compost, as well as coarse river sand and loam, ensuring that they are covered with a very thin layer of about 3-4 mm of sowing medium. Water well with a fine rose and place the trays in a shaded position protected from heavy rain, and keep moist by watering well once every two weeks. Germination can take several months, so be patient. Seedlings should be allowed to remain in the trays for two years,and can be planted out into the garden or into permanent pots in spring at the beginning of their third season, during which time the first flowers can be expected, under ideal conditions. Duncan, G.D. 1989. Haemanthus. In: Du Plessis, N.M. and G.D. Duncan, Bulbous Plants of Southern Africa. Tafelberg, Cape Town. Jackson, W.P.U. 1987. Origins and meanings of names of South African Plant Genera. Part 1. Rondebosch: UCT. Pooley, E 1998.A Field Guide to Wildflowers : Kwazulu-Natal and the Eastern Region. Durban: Natal Flora Publications Trust. Snijman, D. 1984. A revision of the genus Haemanthus L. Journal of South African Botany Suppl. vol. 12. National Botanical Institute, Cape Town.